Over 25 performances, presented by theater companies coming from 13 countries, will be part of this year’s edition of the International Shakespeare Festival. 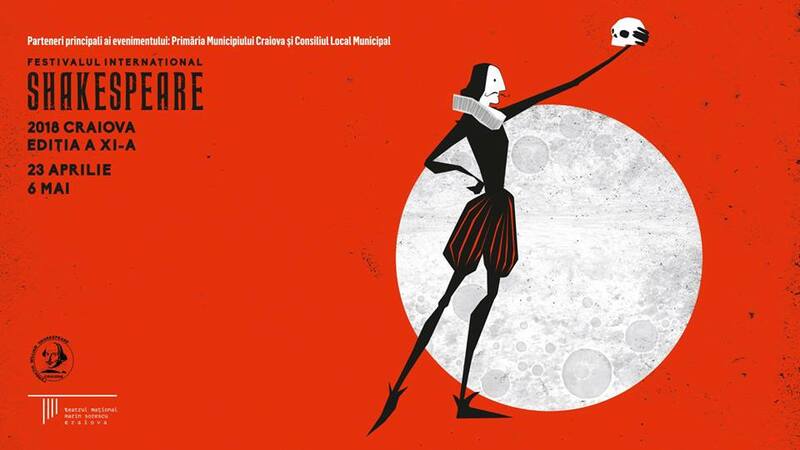 The festival takes place between April 23 and May 6 in Craiova, in southern Romania, under the headline The Shakespeare Planet. Some of the productions in the festival will also be presented in International Shakespeare Festival.. The festival will open with the performance “Shakespeare’s African Stories,” presented by the New Theater in Warsaw, under the direction of Krzysztof Warlikowski. The closing show will be Robert Lepage’s “Needles and Opium.” The performance is presented outside of the Shakespeare program by Quebec-based company Ex Machina. The program, which can be checked here: PROGRAM Craiova Shakespeare 2018, includes performances of companies coming from the UK, South Korea, South Africa, Belgium, France, Japan, Australia, Brazil, U.S. and Romania. The Craiova Shakespeare Festival’s first edition took place in 1994, under the sign of the genius of its literary patron, and also of the director Silviu Purcarete who had staged, at the National Theatre in Craiova, his great performance of ”Titus Andronicus” that starred Stefan Iordache, and had an outstanding international career. Back then, Emil Boroghina decided that every edition was to start on the 23rd of April, the date when the whole world celebrates Shakespeare’s birthday, and the Orthodox church, St. George’s Day. The reputed journalist Paul Taylor saluted enthusiastically the first festival edition in ”The Independent”, and John ELsom concluded: ”we do not have international Shakespeare Festivals like this one in Great Britain”. George Banu defined the Shakespeare Festival as ”an extremely courageous, extremely radical festival. If the festival in Sibiu represents openness, the one in Craiova represents concentration.” Michel Vais published an ample article in the Canadian magazine ”Le Jeu” stating that ”it is, undoubtly, the most important festival dedicated to the English Bard, in a non-Anglophone country” while Maria Shevtsova wrote in the ”New Theatre Quarterly” magazine, Cambridge University Press, that it was ”an amazing festival”. At the beginning, the Shakespeare Festival took place every three years and, from 2006, every two years. It has been organized by the ”Marin Sorescu” National Theatre, the ”Shakespeare” Foundation, and, from the fifth edition to 2014, also by ArCub-Bucharest, then by the Nottara Theatre. Thus, since 2006, the Festival has also extended to Bucharest, involving new audiences and diversifying its events. The International Shakespeare Festival is ”Emil Boroghina’s life’s work”, as Alice Georgescu wrote in ”Dilema veche” magazine in 2010. ”Emil Boroghina’s Shakespeare Festival is like a flight to me. While watching as much as I could of it, I succeeded to meet again great, complex and majestic artists absorbed in Shakespeare’s and in their own fictions, in something fundamental about people and about theatre as a vital substance” Marina Constantinescu wrote in ”România literară” magazine. The 2010 edition’s motto was ”Hamlet Constellation” (Shakespeare and the New Theatrical Reality), and in 2012 the title was ”All the World’s a Stage and All the Men and Women merely Players”. The edition of 2014, „Everybody’s Shakespeare” – whose programme was considered „sensational” by Michael Dobson, Director of the International Shakespeare Institute in Stratford-upon-Avon – celebrated the Bard’s 450th birthday, while the motto of the edition of 2016, the year marking the 400th anniversary of Shakespeare’s death, was ”Shakespeare for All Time”. The Shakespeare Festival in Romania has extended gradually, involving larger and larger segments of audiences, presenting the guest performances in more and more locations, and projecting the Bard’s work into eternity. Thus, ”Planet Shakespeare”, this year’s title, forms part in the natural order of things, as long as the 2018 edition brings performances from every continent, from Europe, Asia, Australia, North America, South America and Africa.